Why is the 2018 Gerber Baby Causing Some Parents Great Anguish and Grief? 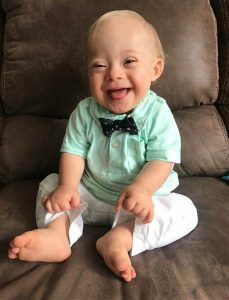 If you checked out your social media feeds the last few days, you have no doubt come across the smiling face of Lucas Warren, the new 2018 Gerber Baby. Lucas is the first child with Down syndrome to receive this honor. For many parents this award sent a welcome and life-affirming message. Giving this award to a child with Down syndrome certainly sends a message of acceptance and love to families with a disabled child. Yet the award also reminds of us of a shocking paradox. Many parents will see in that cute little 2018 Gerber Baby a painful connection to the memories and feelings associated with a past abortion of a child with Down syndrome. These couples face great pressure and anxiety at the time of the diagnosis. Parents are usually persuaded that termination of the pregnancy is the more compassionate course of action. – They continued to be offered abortions right up to 36 weeks, with 50% of them being offered abortion later than 20 weeks. – 62% described the language of their medical team as being negative; clearly indicating that Down syndrome was a bad outcome…Only 4% described the language of their medical team as positive. What is the experience of a parent who decides abortion is the best solution to a poor prenatal diagnosis? Chloe Ashton tells the story of the pregnancy of her son Tommy diagnosed with Down syndrome. The amnio itself was a heart-wrenching experience; there was my baby on a screen as if he was right in front of me — and as the needle entered my amniotic sac, he reached out and grabbed it, and they had to wait to withdraw it as he had a firm hold of it in his little hand. The testing confirmed her son had had Down syndrome and she made the decision with her partner to have the abortion. “[My young daughter] had become extremely attached to her little brother — who she’d named Tommy — kissing my belly daily. She was so excited to have a sibling on the way…I sobbed and told her that we had found out that Tommy was sick…and we weren’t sure if he would still be in my tummy when she got back. How did the procedure impact Chloe? “I wish they had better prepared me for the emotional aftermath. My relationship ended within six months…. It was months before I stopped feeling the phantom kicks. Chloe may have considered a different course of action if she was affirmed and supported by her partner, family and friends in parenting a child with Down syndrome. A number of people played a part in this child’s death. Some of them will be intimately impacted by this loss, such as Chloe’s daughter who mourned her lost sibling. This dispels the myth that abortion is a private and personal decision between a woman and her health care provider. As Chloe’s story reveals, abortion is more accurately a life changing event – a series of unfolding Shockwaves and after-shocks that continue to impact individuals, couples, families and friends years after the procedure. Chloe shares at the close of her story a common symptom for those that participate in the death of their unborn children – a struggle to forgive one self. “As I sit here today, almost three years later, I pray for those who may be going through this, and I try to forgive myself. The struggle with guilt and self forgiveness is common after abortion. This is especially true with later term procedures when parents initially receive the news of their pregnancy with great joy. Mothers and fathers begin the physical and emotional process of bonding with their unborn child that they can clearly see on the ultrasound screen and mothers can feel kicking in their wombs. But all symptoms after abortion can be understood as a type of memorial to the unborn child – a dysfunctional and painful connection to a parent’s rejected and broken baby. An abortion recovery program provides a healing process and support from others who understand your loss. They can help you find the emotional and spiritual peace you hunger for. Parents like Chloe, wounded by abortion, can discover in that recovery process that not all is lost. They can embrace the gift of God’s mercy and forgiveness as they reconnect in love with their child, who is alive in the Lord. This entry was posted on Friday, February 9th, 2018 at 7:13 pm	and is filed under Uncategorized. You can follow any responses to this entry through the RSS 2.0 feed. You can leave a response, or trackback from your own site.